Normally a dinner at our place consist of some kind of meat and a salad on the side. In general we try to cut down on food with high content of carbs like potatoes, white rice and pasta and replace it with delicious salads. 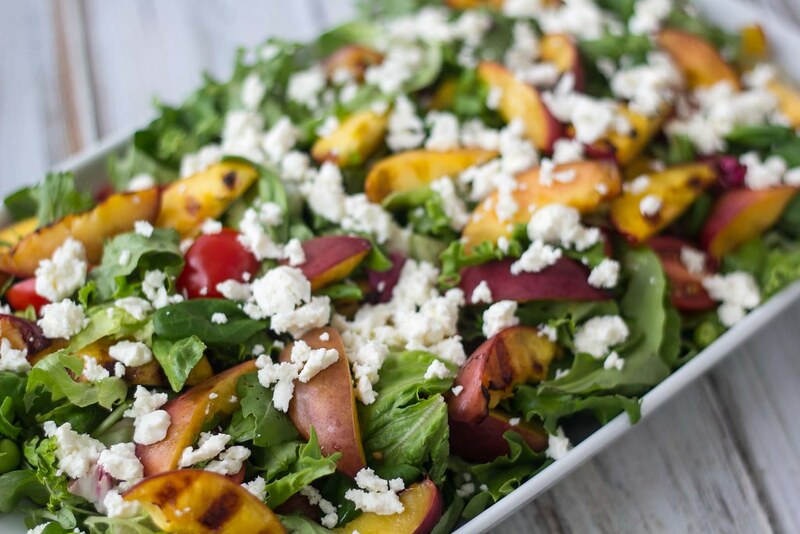 This time we have made a simple salad with fresh and grilled nectarines. The nectarines are rinsed, cut in halves and then grilled for about 10 minutes – this makes them nice and soft. 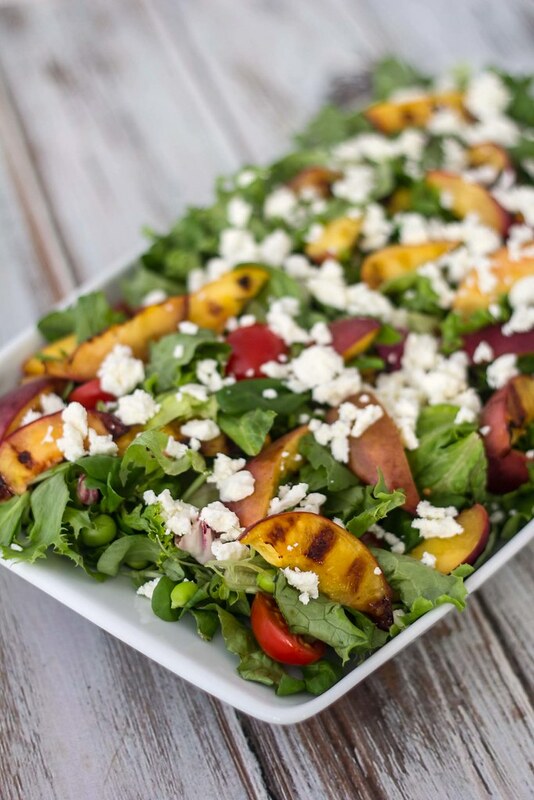 This salad is a real summer salad and perfect for a barbecue party, however, it can be eaten all year around. The salad goes great with most meat. 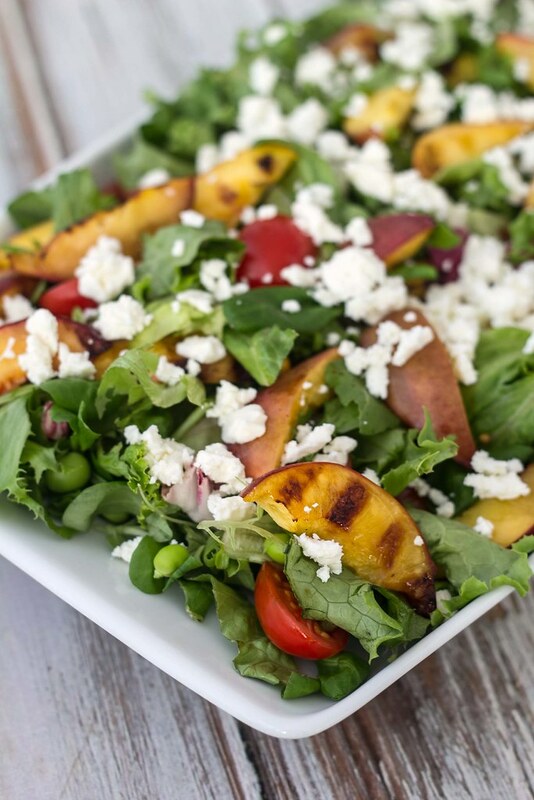 We think that adding fruit to a salad will just make it so much better. In the summer period, where our farmers market has tons of fresh fruit, we eat so many delicious salads. You can see some of our other salad recipes in our salad archive. Step 1: Rinse the nectarines/peaches, cut them in halves and remove the stone. Step 2: Grill the nectarines for about 10 minutes or until them are nice and have grill stripes. 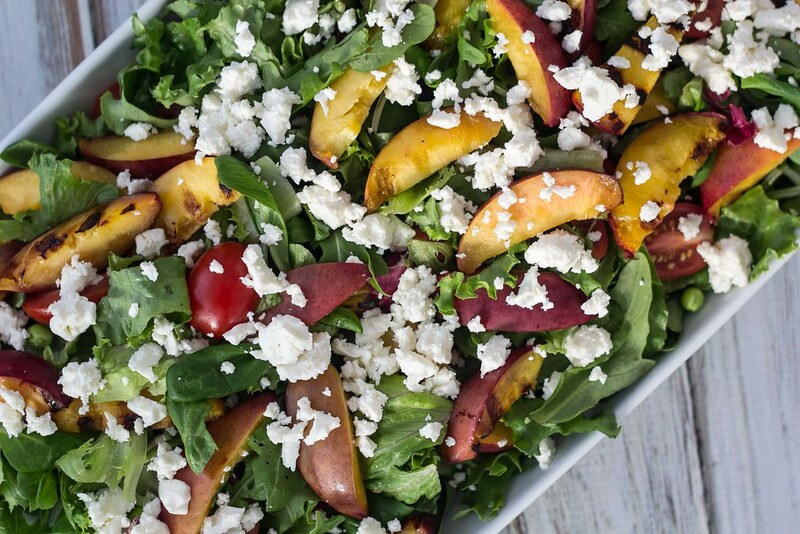 Step 3: While the nectarines are on the grill, wash and clean the salad leaves and put them on a salad plate or in a bowl. Step 4: Rinse the cherry tomatoes and cut them in half. Mix them with the salad leaves. Step 5: Remove the peas from their shells. You can also thaw some frozen peas and use them. Mix them in the salad. Step 6: When the nectarines are done, cut them in smaller pieces and put them on top of the salad. Step 7: Crumble the feta over the salad. Tip: Serve the salad as a side dish to some delicious meat.